"Handwriting". As an OT, it's probably one of my least favorite words. And yet, it's also probably the word I hear most often. Right behind the "I have a kid who holds their pencil funny" is the "I have a kid who has AWFUL handwriting." Before addressing Graphomotor, or handwriting skills, I want to remember each reader of something that I tell my teachers all the time - not every child is going to have beautiful handwriting. For example, my husband's handwriting looks like chicken scratch. But, somehow, he made it to be a Physician Assistant. So before you try to produce the next John Hancock, remember - if it's legible, then don't fix it. The second point that I want to mention is at some point, you have to say, "it is what it is." It's the 21st century, and most schools don't have the "Penmanship" class that I had. But they do have access to computers, laptops and other word processing devices that may make it easier on both the student and the adult. If you have an older child (I usually say 3rd grade and up) that hasn't responded to Graphomotor intervention, let them use these devices for written work. It will save the child frustration and allow you to assess academic skills instead of trying to decipher hieroglyphics. Dibels. DRAs. Benchmarks. I'm sure if you have a child who is school age or are a teacher yourself, these words are part of your everyday language. 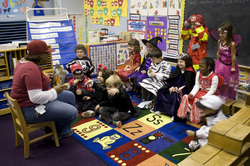 Reading and comprehension is the focus of the academic day, and it starts as early as kindergarten. It is wonderful that our society is instilling reading skills at such an early age. But the unfortunate part is, in order to make time for these lessons - other lessons had to be cut. And in most schools, the first thing to go was the penmanship program. There is no longer just a lesson on how to make a letter. Sure, the teacher will show the students how to make the letter, but they also will show them the letter's corresponding lower case partner, the sound it makes when it's in the middle of a word, the sound it makes when it's at the end of the word and 10 words that start with it. With all that information, it is almost impossible for the student to remember what line/curve strokes made up the letter, let alone how to draw them AND how to make them fit correctly on a writing line. My point is, handwriting has to be taught. And just like you wouldn't try mixing a spanish lesson with alegbra, it needs to be taught independently of language arts or reading concepts, especially in kindergarten. The best way to teach handwriting, in my personal opinion, is the Handwriting Without Tears method. I have seen teachers use a variety of other programs - Fundations (R), the D'Nealian approach, the Zaner Bloster approach, just to name a few - and it is the only program to teach letters in a DEVELOPMENTALLY appropriate sequence (remember the Pre-Writing sequence?) Sometimes this upsets teachers, because it doesn't correspond with the sequence teachers instruct sound-symbol relationships, or is it alphabetical order. But I assure you, it really doesn't make that big of a difference. And at the end of it, you have a child that can WRITE and READ letters. That's what counts. I do not take ANY credit for the program I've compiled for "teaching" handwriting. The sequence I teach the letters in, and the strategies I use are ALL ideas from Handwriting Without Tears. I have made modifications and changes based on the needs of my students or my classroom teachers. The information below and the activities on the Graphomotor Activities page is just a small tip of the iceberg. Go to the conference, you will thank me later. Before going into teaching how to make letters, there are a few things you need to introduce to a child. The first being size concepts. A child needs to be able to tell the difference between a big line and a little line. Think about the letters "h" and "n" - if a child does not have a good understanding of big and little, then those letters look the same to them. The second concept is direction - where is the top, where is the middle, where is the bottom? This will help the child orient themselves to determine where to start/end lines to form letters. The last, and most important part, is a writing line. Don't assume a child knows how to use a writing line. To most kindergartens, it just is some drawing that looks like a street. When you give them a paper with many writing lines, it looks like LOTS of streets. They need to be taught that a writing line consists of THREE parts, a top line, a middle (dotted) line and a bottom line. Make sure to give these parts names that you use consistently. You can call it the "sky line" or the "starter line" - whatever you like - but make sure that you use the same terms all the time so you don't confuse the child. I like to use "top", "middle" and "bottom" because the child can relate it to many objects in their environment - their bodies, the blackboard, a picture, etc. I also like to color-code the lines for younger children to help visually cue them. I always make the top line green, the middle line yellow and the bottom line red. Also, when a child is just learning how to use a writing line for printing, I only present one writing line at a time. Giving them more than one writing line can be confusing, because instead of 3 parts, it now looks like 6 or 9 parts. Keep it simple until you think the child has a good understanding of using a writing line, then use lined paper. When we addressed Pre-Writing Skills, we discussed how the formation of lines follow a developmental sequence. It would make sense, then, to teach letters than are formed by the "easier" lines first. Capital letters are the easier of the two types (the other being lower case) to form. Capital letters are made up of four basic shape components: big lines, little lines, big curves and little curves. That's what makes them easier than lower case letters. Lower case letters have no "consistent building blocks". They have big lines, medium lines, hooked lines, tails and all sorts of other funny shapes. While capital letters ALWAYS start at the top, lower case letters may start on the top, but they may also start in the middle. Lower case letters also involve more complexed Pre-Writing Skills, such as retracing (think of how you form the letters "r" or "h" - you make a line down, then retrace back up that line and make a hook or a bump). It is reasons like those why you should hold off on teaching how to form lower case letters until capital letters are mastered. I understand that this means your kindergarten student will be printing in all capitals, which is not grammatically correct. But, you will be able to read what they are writing and they will be able to express themselves on paper with less frustration. So you weigh the pros and cons and do what you are comfortable with. Following the developmental sequence of Pre-Writing Skills, Handwriting Without Tears teaches capital letters in groups based on what lines form the letter. As one would guess, the first set involves horizontal and vertical lines. Then, curved lines are introduced, and lastly diagonals. Letters are also grouped by common shapes (i.e. O and Q). Below you will find the letters and a description of how they are formed. Handwriting Without Tears also uses a creative method of "frogs, magic bunnies" and other child friendly strategies. The Frog Jump and Magic C letters are directly from Handwriting Without Tears, I have made modification on the other groups that I found have worked well with my students. The first set of capital letters that Handwriting Without Tears teaches is the "Frog Jump Letters". They are called "Frog Jump" because each of these letters are formed by starting at the top line, making a big line down to the bottom and "frog jumping" back to the top. 1. F: Start at the top, big line down to the bottom and stop. Frog jump to the top (ribbit), little line across. Jump to the middle (ribbit), little line across. 2. E: Start at the top, big line down to the bottom and stop. Frog jump to the top (ribbit), little line across. Jump to the middle (ribbit), little line across. Jump to the bottom (ribbit), little line across. 3. D: Start at the top, big line down to the bottom and stop. Frog jump to the top (ribbit). Big curve to the bottom. 4. P: Start at the top, big line down to the bottom and stop. Frog jump to the top (ribbit). Little curve to the middle. stop. Another little curve to the bottom. 6. R: Start at the top, big line down to the bottom and stop. Frog jump to the top (ribbit). Little curve to the middle. Little line slide right to the bottom. 7. N: Start at the top, big line down to the bottom and stop. Frog jump to the top (ribbit). Big line slide to the bottom and stop. Big line up to the top. 8. M: Start at the top, big line down to the bottom and stop. Frog jump to the top (ribbit). Big line slide to the bottom and stop. Big line slide to the top and stop. Big line straight down to the bottom. R, N and M are very difficult letters. Take your time teaching them, and spend an extra few days having the children practice them. The second set of letters is the "Magic C" letters. Handwriting Without Tears uses the concept of a magician's magic bunny to turn the letter "C" into other letters. 1. C: Start at the top, big curve to the bottom. 2. O: Start at the top, big curve to the bottom, keep going, big curve back to the top. 3. Q: Start at the top, big curve to the bottom, keep going, big curve to the top. Put your pencil in the middle, little line slide to the bottom. 4. G: Start at the top, big curve to the bottom. Little line up to the middle. Little line across the middle. I adapted this group to be the "Big Line Letters" because of the letters start with a big line down. I use a tree to symbolize the way the letter stands straight and tall. 1. L: Start at the top, big line down, letter line across the bottom. 2. H: Start at the top, one big line down. Back at the top, another big line down. A little line across the middle to make a bridge. 3. K: Start at the top, big line down. Back to the top, little line slide to touch the middle of the big line. Another little line slide to the bottom. 4. U: Start the top, start a big line down, quick U-turn to the right at the bottom, big line back up to the top. 1. T: Start at the top, big line down. Jump to the top, little line across like a hat. 2. I: Start at the top, big line down. Jump to the top, little line across like a hat. Jump to the bottom, little line across like shoes. 3. J: Start at the top, big line down, quick U-turn to the right. I start diagonal line letters by talking about a slide and introducing how a slide may go to the right or to the left. I have the children practice making diagonal lines by drawing triangles, waves or pointy design patterns. 1. V: Start at the top, big line slide right to the bottom. Big line slide up to the top. 2. W: (Show the children that the letter "W" is actually two "Vs" connected together). Start at the top, big line slide right to the bottom. Big line slide up to the top. Big line slide right to the bottom. Big line slide up to the top. 3. X: Start at the top, big line slide right to the bottom. Jump to the top, big line slide left to the bottom. Criss Cross! 4. Y: (The Y I teach does not look like the font used on this page. It is made of two lines, not three). Start at the top, little line slide right to the middle. Jump to the top, big line slide left to the bottom. 5. A: Start at the top, big line slide left to the bottom. Jump to the top, big line slide right to the bottom. Little line across the middle. 6. Z: Start at the top, little line across. Big line slide left to the bottom. Little line across. "S" didn't seem to fit anywhere else, so I made it it's own set. It's a letter that is commonly reversed, so it's s good idea to teach it by itself. 1. S: Start at the top, little curve to the middle. Stop. Make a backwards little curve to the bottom. Lower case letters don't involve the same building blocks that capital letters have. Instead, Handwriting Without Tears groups them by similar writing strokes. Then, they are further broken down by their placement on a writing line. Before you attempt teaching how to form lower case letters, a child MUST be introduced to the fact that lower case letters are "tall" (like letters b, h, t, or f); "small" (like letters o, a, e or c) and "fall" (like letters g, j, y or q). You can use whatever terminology you are comfortable with. I have found that relating a writing line to a house works well with children. They have a good concept of where "the attic" is, where "the basement" is and where "the middle" of the house is. I like to add a little story to make it more interesting - I have my "spiders in the stinky basement"; my "grandma knitting in the attic" and my "friends playing Wii in the living room in the middle". Another way I like to introduce the idea of "tall", "small" and "fall" letters is the "Alphabet Stretch". It's a great gross motor activities that involves some Sensory components, and allows the children to get a movement break in WHILE learning. The concept is simple - if a letter is a "small" letter, you touch the middle of your body (your belly). If a letter is a "tall" letter - you put your hands up in the air. If a letter is a "fall" letter, you put your hands on the floor. Then you recite the alphabet, while doing the corresponding movements. It's fun to have "Stretch Offs" between a group of students (similar to a spelling bee where if the child makes an error, they sit out, until there is only one person left). Make it more easier by having a visual model of the alphabet on a writing line without view. Make it more difficulty by having the child close their eyes while performing it so that have to rely on their cognitive and memory skills to recall where the letter is. You can find directions on the alphabet stretch on the Graphmotor Activities page. Handwriting Without Tears offers a fabulous course called The Print Tool which instructs you on how to identify what the underlying problem is and how to address it. You can find some ideas that I use from this program, as well as some other ideas that I've constructed myself under the Graphomotor Activities tab.